Soooooo Meatless Meals, I’m going to admit that I love meat, most of it, I’ve often thought about going the vegetarian route just to see if I could do it, my best friend actually did it for 3 weeks after the New Year and she said it wasn’t as hard as she thought it would be, I cook a lot of chicken, I try to only have beef one night a week so that leaves 1-2 nights a week of meatless dishes. I could literally live on pasta but seeing as it’s not the healthiest option in the world I continue to cook meat! I’m sure excited to see these dishes because since I’m hosting this event I’ve been looking at the titles and drooling over them all week! A lot of people I know are Vegetarians or Vegans, it’s why I have a section on my blog for those recipes. When we invite friends over for a get together or a party I always make sure there is something on the menu for everyone. I respect everyone and anyone for there food choices and I’ll always make sure I have recipes here for everyone. Since having my second baby last summer and realizing my husband and I aren’t getting any younger (can you believe it) I’ve been trying to get my family even healthier than I thought we were. I don’t believe in never having chocolate again, or pizza even, I think I’d go through withdrawals if I had to give up pizza! However cutting out all processed foods and adding more fresh fruits and veggies to our diets is what I’m shooting for this Summer. Whether you choose meat or not there are always ways to stay fit and healthy! So let’s enjoy these Meatless this week! Now let me share what I decided to bring to the table for this weeks #SundaySupper. I’m pretty addicted to making my own rice pilafs, cream of anythings soups, and sauces made of veggies these days so here is one “rice pilaf” I experimented with that was fabulous! I’m keeping it on the healthy side so feel free to go outside the box if you want! I prepared this casserole in no time because I always chop my veggies once or twice a week and store them in the fridge for go to recipes like this. Chop broccoli, onions and mushrooms into small pieces. Sautee onion in olive oil for 5 minutes, add mushrooms and broccoli and sautee for another 5 minutes. Meanwhile cook the rice (2 cups of prepared brown rice actually equals one bag of cooked brown rice). Preheat oven to 350. In a casserole dish mix together the cooked rice, sauteed veggies and minced basil. In a separate bowl whisk together the milk, egg whites, salt and pepper to your liking and stir in Parmesan cheese. Pour mixture into the casserole and mix to combine. Cook casserole uncovered for 20 minutes. Cover with tinfoil and cook for another 10 minutes. If it hasn’t browned feel free to cook totally uncovered however mine started to brown so I covered it to finish. Nutritional Value: Please note this is an approximation. Now……onto what everyone else brought to the dinner table this week! I love making my own rice combinations, too. Mushrooms and broccoli are great add-ins! Cheesy, broccoli rice? I am so in. Thank you for hosting us this week! 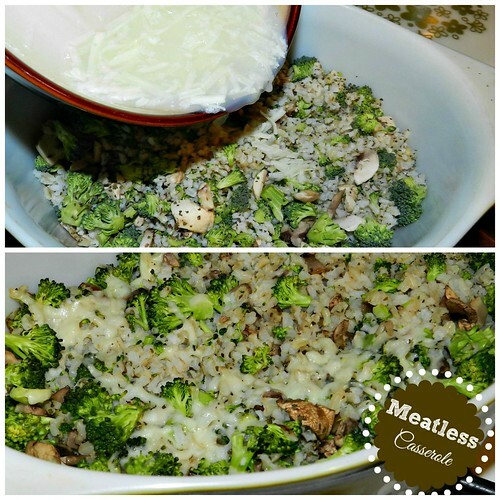 This Broccoli, Mushroom & Rice Casserole looks fabulous! I think I could go completely vegetarian with maybe a meat dish a few times a month but my husband and kids would die. they love meat. 🙂 Thank you so much for hosting today! what a fabulous line-up of meatless dishes we have today! Thanks Alice! Add some cooked chicken to this dish and you’ll have an easy meal to please your whole family! Thanks for stopping by! A great healthy casserole and easy to put together! Thanks for hosting this week! Wow, you’ve nailed this meatless challenge! You’ve got all of my favorite non-meat ingredients in your casserole and not only I, but all of my meat-lovers in my family would gobble this up! PS: I agree with you, I could never give up pizza! LOVE your blog and happy to now follow you.! Yum! I think I could eat the whole batch of your broccoli and mushroom rice casserole!! This sounds really good although my hubby would consider it a side dish for his meat 🙂 I don’t see my family ever going vegetarian either, although I do enjoy having meatless meals sometimes. I hear you Brianne! We actually did have it as a side dish, add some cooked chicken in there and make it a meal though! That’s what I say Liz! Seconds all around for sure with this one! My 8 mth old ate it! You have a great food philosophy! I don’t want to give up any of my favorite foods either, but on a day to day basis, I try to eat very healthy! This is a great meatless meal! This recipe is perfect for my family of broccoli and mushroom lovers. I especially can’t wait to make this for my 4 year old…he’s going to love it. Thanks for hosting this week! What a great meatless option, Tammi. Thank you for hosting today’s event. 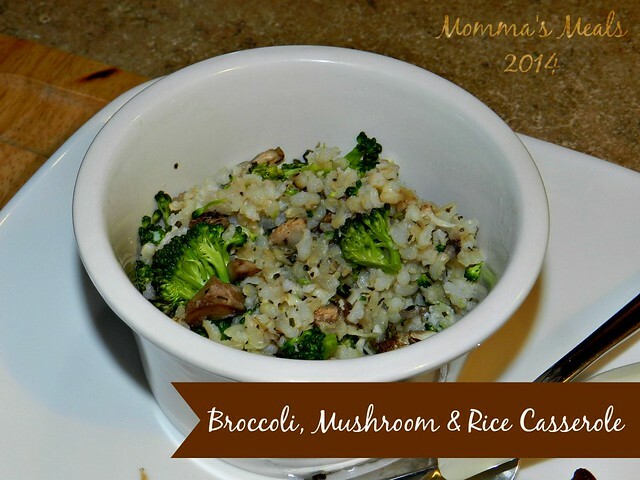 Broccoli, mushrooms and rice — sounds like a great meatless meal to me! Yum! This sounds amazing! What a perfect meatless dish! Thanks so much for hosting this week, Tammi! This is the kind of dish my husband and I would enjoy on Meatless Monday! I’m there for a bowl! You know I love rice and mushroom dishes! Thanks so much for hosting us this week!! I know it’s a bit of work, and really appreciate it. And I love your meatless meal. Rice + Cheese + Broccoli = Happiness! This sounds like the perfect weeknight casserole! Thanks for hosting this week! Both a colorful and tasty casserole. Looks nice to have it by itself or as a side for the carnivores. Ooh such a yummy dish and something my kids would love too 🙂 I also look for easy one pot meals for weeknights and this seems perfect!Thanks for hosting Tammy! Thanks for hosting Tammi. I love this casserole and that you chop all your veggies in advance. I really need to do that to save some time in the kitchen at dinner. You can’t go wrong with broccoli! This looks a lot healthier then the broccoli and rice casserole I use to make. Can’t wait to give it a try. Creamy mushrooms and broccoli casserole…YES PLEASE! Thanks for hosting, Tammi! 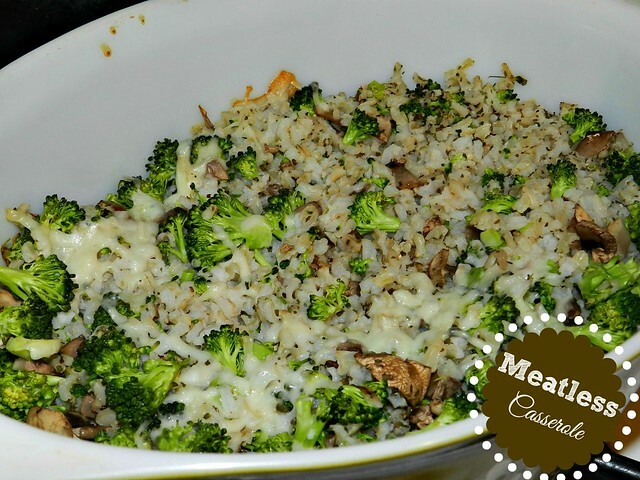 I love rice dishes with lots of stuff added in–especially broccoli and cheese!